It is really a sin, just as the blurb says, to reveal anything from a Dan Brown book. So, avoiding spoilers in this review is the best tribute I can give to the writer. 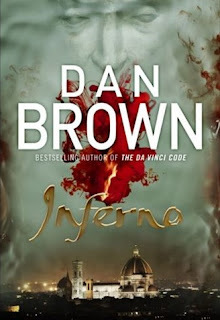 Inferno, his sixth novel, but the fourth featuring the now famous character Prof. Robert Langdon, had enough twists and turns, to keep me on tenterhooks all the while. Even on the 450th page of the 480-page hardcover, I was completely unsure about how it will all end. No wonder, since its release on May 14, Inferno has been on the top of the New York Times bestsellers list (Latest list here). This time, the Harvard Professor of Religious Symbology is in a tearing hurry, racing through the pages, yet again with another beautiful young lady, trying to unravel complex codes from art and literature of the renaissance period, to save the world. But, strangely, the whole world is hell bent on making him fail. Actually, ‘Hell’ is the key word. Drawing great inspiration from Dante’s Divine Comedy which is actually made up of three canticas - Inferno (Hell), Purgatorio (Purgatory), and Paradiso (Paradise) and also from Malthus’ principles predicting a population catastrophe, one evil genius is doing something terrible to mankind at a global scale. What exactly is it? When will it happen? Can Langdon stop it? And, in time? These are the questions that will boggle our minds as we run with the professor and the lady doctor, through Florence, Venice and another famous city which you can find out for yourself, when you read the book. The plot begins with Robert Langdon waking up in a hospital with strange dreams and 'retrograde amnesia'. I had recently learned about 'retrograde amnesia' from a Bollywood movie. It is a loss of memory-access to events that occurred, or information that was learned, before an injury; a partial memory loss of recent past. In the movie Jab Tak Hain Jaan, Shah Rukh Khan plays a character that suffers the same memory lapse. It made me wonder if Dan Brown was a Bollywood fan. But then, that is beside the point. Trying hard to recall his memory, our protagonist realizes he is thousands of miles away from his natural habitat, the campus of Harvard University. He is in some small hospital in Florence. But someone doesn't want him alive. And from here, the race begins as he seeks to find out what he himself was after. And why. The troubled young prodigy Dr Sienna Brooks helps him escape his pursuers. We get to learn a lot about Florence as the couple dodges their pursuers through museums, gardens, churches and some mysterious passages in between them; as they give readers good value for money. Some literary critics have, however, lambasted this book saying Dan Brown is 'the worst prose stylist in the universe', and 'the most dastardly thriller writer who compels the reader on a headlong quest after clues and revelations'. But I have seen prose of some Man Booker Prize winning novels where grammar is completely thrown to the wind. And I have read writers with half-baked knowledge of history, passing of as erudite when, in actuality, their writing is downright childish. Some call Dan Brown’s writings as being primarily focused on minting money. They allege he creates religious controversies like how The Da Vinci Code did. But isn't money something most writers hope to get from their books? And in the course of it, if they are increasing our knowledge and critical reasoning, what is wrong? I feel The Da Vinci Code made the readers to revisit scriptures, which is good. As a Christian, therefore, I would not approve of his ideas or agree with his opinions. But as a reader I must acknowledge his penchant for research and his talent in employing that gripping writing style. He uses many facts but he tells us that it is all fiction. So, why raise a hue and cry on some harmless fiction? I believe good writers of fiction must know how to weave historical knowledge into engaging stories. And Dan Brown does just that, once again, with Inferno, very effectively. With amazing facts from art and literature, with shocking truths from history and archaeology, and with mind-boggling advances in genetics and biochemistry, this is a veritable fare, a power house of knowledge. If one cannot stomach this kind of writing, they can stick to vampire romances, political deceptions, or those sexual shades of fifty or more. Dan Brown’s writings make his readers want to visit the places mentioned, even if one has already visited them earlier. This time, for a closer and better look. If Angels and Demons is largely set in Rome and Vatican City, The Da Vinci Code in Paris and London, and The Last Symbol in Washington DC, Inferno is set in Florence, Venice, and another city which you will have to find out when you read the book. And you will want to visit all those places. Calling this book 'a page-turner' seems absolutely hackneyed. But it is an apt phrase, nevertheless.